On my two day layover in Ireland, I wanted to fit in as much as I possibly could. While Dublin is an incredible city to explore, you know I much prefer being in the depths of nature; listening to the waves crash against the rocks, and admiring the endless emerald hills rolling over one another. 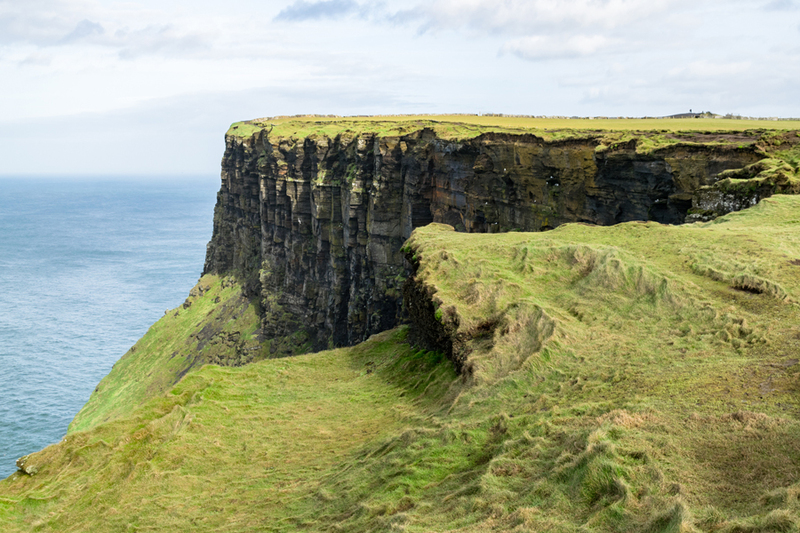 Before arriving in Ireland, I was told by many people that I had to visit the Cliffs of Moher. 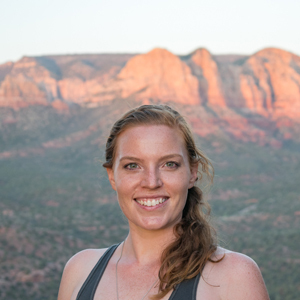 So, after doing some research, I decided to book a day tour with Wild Rover Tours. I obviously didn’t research enough because, until the evening before, I hadn’t realized that the Cliffs of Moher were on the other side of the country. I was relieved there was a company who would take care of all the details. I couldn’t have arrived in Ireland at a better time, even though it was the middle of winter, a long spell of rain had just ended and the sun was shining hard for the people of Ireland. A very special treat. The tour bus left at 7am sharp from outside Gresham Hotel on O’Connell Street in Dublin, a convenient walk from my accommodation. Three ladies running a few minutes late nearly missed the tour altogether, so make sure to be punctual! The Irish don’t stuff around it seems! One thing I really admired about the tour was their ability to keep on schedule. If you’re concerned about being back in time for plans you’ve made in the evening, don’t be, as you will be back in the city when they say you will. I was amazed that the large coach was completely full on a Wednesday in the middle of February and glad I had booked in advance. I also found it interesting that the majority of travelers were a similar age to me. Our tour guide, Kim, was fantastic. She let us know what we could expect from the day before letting us nap in peace for the next couple of hours. 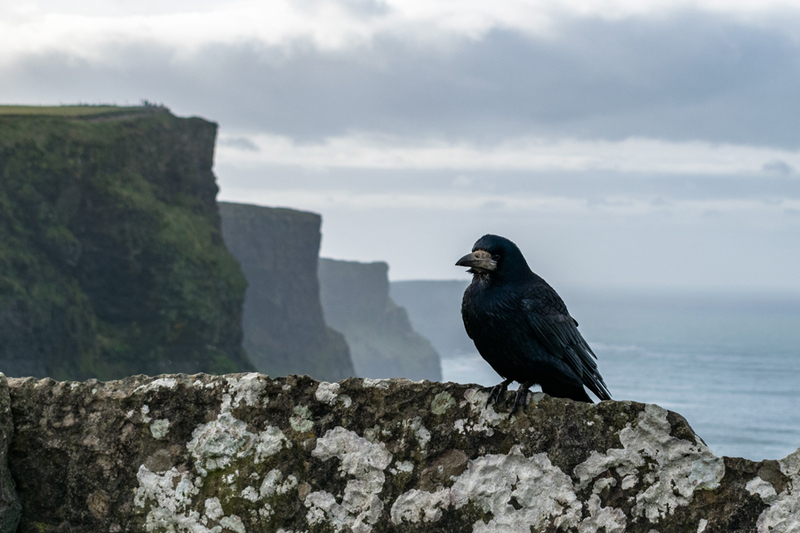 When the sun rose, Kim gently woke us from our sleep with that charming Irish accent and began to point out ruined castles and other landmarks as we drove along, giving a brief entertaining history along with it. I appreciated the Irish soundtrack they had going, which fit in with the history lesson flawlessly. Despite Dublin and the Cliffs being on total other ends of the country, it’s amazingly only a three-hour drive. The stops along the way were perfectly timed. First being Barack Obama’s Plaza, an Irish gas station named after the man himself. If you’re feeling as bewildered as we all were, it turns out that the US President discovered that his great-great-great grandfather migrated at the end of the Great Famine in 1851 from this quaint village called Moneygall. So naturally, Obama came to visit and flew in via helicopter of course. 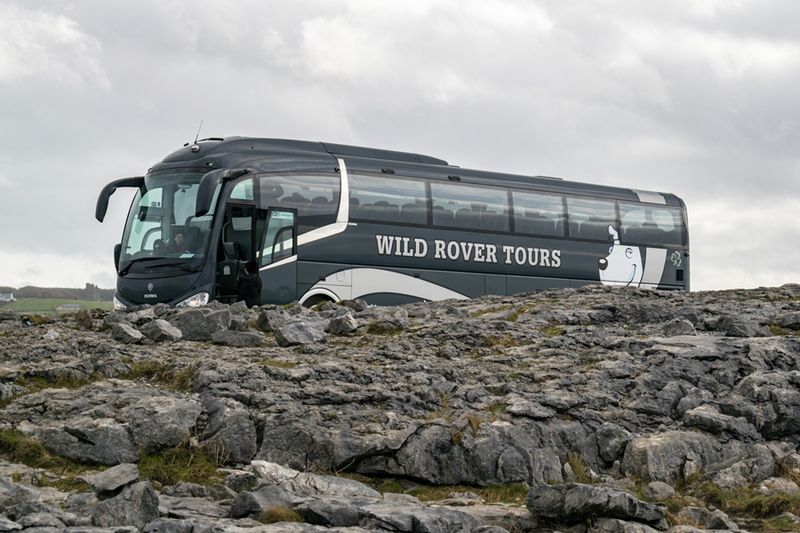 What was appealing about Wild Rover Tours was the amount of time they allocated for the Cliffs of Moher. They give you a whopping 2 hours which is more than any other tour company. This is the perfect amount of time to enjoy a coffee with morning tea and to wander along the path further than most others get to. I can imagine this being a big bonus when the crowds are much thicker in summer. We were warned by Kim before disembarking the bus not to get too close to the edge. While it seems tempting (and something I would normally do), she had some pretty good points about the frequent landslides which occur and the sudden bursts of wind which can easily sweep you away. Before taking that daring selfie, keep in mind that over the last 25 years, more than 65 people have died falling off the cliffs. Now that morbid statement is out there, let's get into the awesome facts. These cliffs sit 230m // 750 feet above the Atlantic Ocean and stretch over 8km // 5 miles. 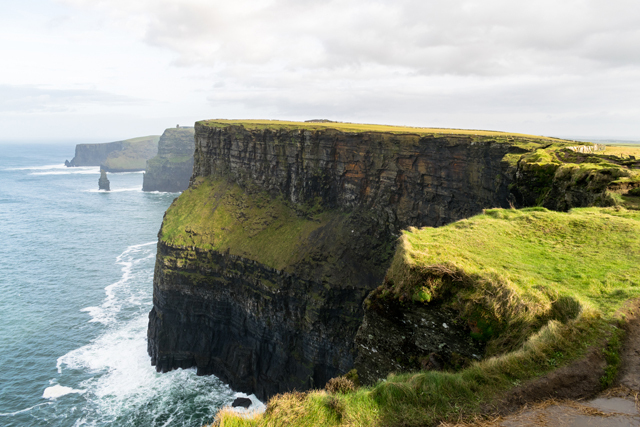 They were named the most visited natural attraction in Ireland and ranked the best ‘cliff-view’ on the planet by Conde Nast Traveler. The views were simply unbelievable. The green foliage contrasted against the dark rocks and turquoise blue sea was a magical combination. The shape of the cliffs changed with every footstep and when you were far enough away, O'Brien's Tower looked like a little Lego house sitting on these mighty cliffs. The fresh ocean air blew my hair all over the place, but I was loving it! I know it looks like I'm near the edge but I promise I'm not! A few tips: Though the sun was shining, the wind was cool and strong, so I was very happy to have brought my scarf and down jacket. If it’s raining, don’t bother with an umbrella! Also, wear shoes made for mud. I wore my Keen hiking boots and though I felt a little silly in the bus when I saw others with trendy white sneakers, I was more than confident trenching through that mud! Guys, I saw a lady in strappy heels… just… please… no. 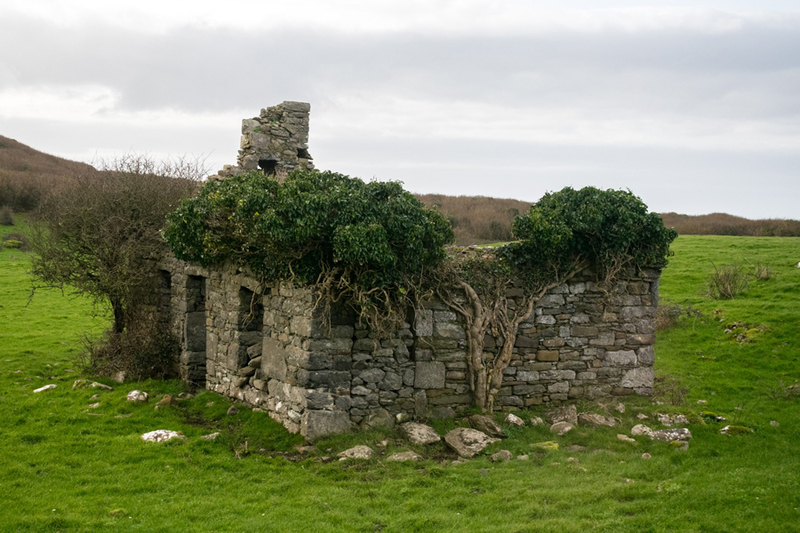 As we headed north, we made a stop at the Burren, a very unique landscape on the coast. 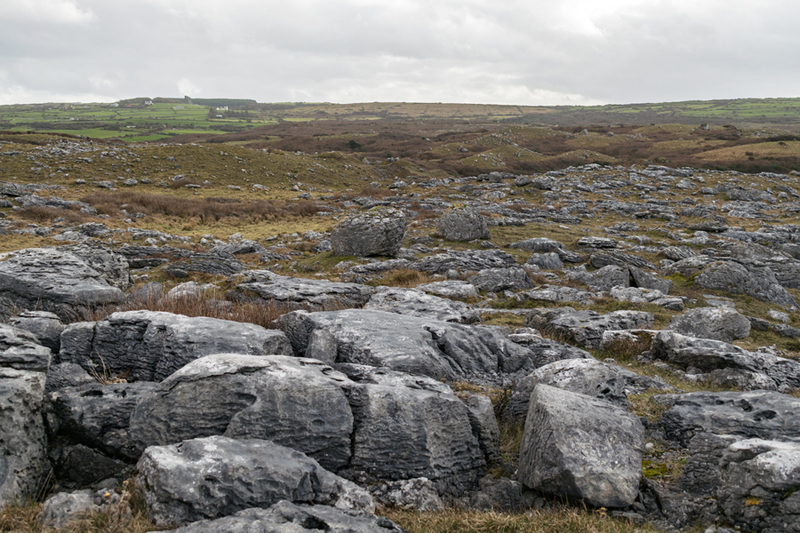 The word “Burren” came from the similar Irish word “Boíreann” meaning a rocky place. Once you visit it’s clear to see why. J.R.R. Tolkien actually drew inspiration for Lord of the Rings from here, can you guess for what scene? Another hour of stunning scenery later, we arrived in Galway, Ireland’s cultural capital. Kim offered those who wanted an inclusive 30-minute tour of this artistic, boho town, but I was feeling the fatigue from all my recent travels and decided to take myself to a little café down an alleyway. I sat in the window and watched the locals laughing and chatting as they walked past, and felt a sense of belonging with the amount strangers similar in appearance to myself… pale and ginger! In the two hours we had in Galway, I took a wander around the town, stopping to eat a hearty lunch where Kim had recommended, watching buskers playing Irish jigs on the street, and strolling down narrow streets to find bookshops, boutiques, and historic details. I was really impressed with the professionalism or the Wild Rover staff and tour bus. They did a great job of keeping this long day light and entertaining, meeting everyone's needs when it came to bathroom stops and food. We were all exhausted on the way home but were more than satisfied with the day we experienced. I was stoked I could see so much in the little amount of time I had in Ireland. If I was there longer, I would have definitely booked some of Wild Rovers other tours, I especially had my eye on their Giants Causeway, Belfast City & Carrick A Rede Rope Bridge Day Tour from Dublin. I guess I'll just have to go back! If you have any questions about the tour, please comment below or send me a DM on Instagram! 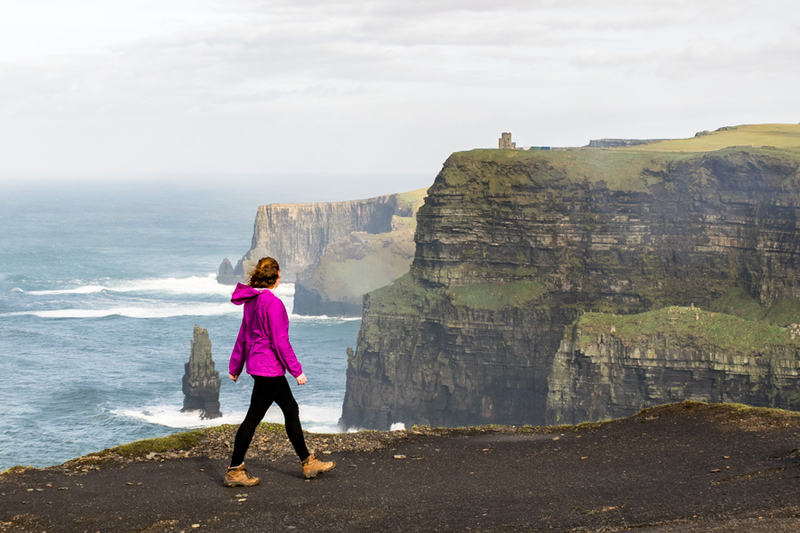 booking.com has over 6,900 properties in Ireland including hotels, apartments, and hostels. You get free cancellation on most rooms and a best price guarantee. Airbnb is an online booking system which connects homeowners wanting to rent their homes or a room with travelers who are looking for accommodation. Click here to get $$ off your first stay!